Much of the current speculation about what the LibDems will do if the election on 6 May returns a hung parliament is based on a misunderstanding of how the system now works. There’s particular confusion over which party leader will “be invited to form a government” after the election if Labour winds up with more seats in the House of Commons than any other party, but has won a smaller share of the vote than the Conservatives, and possibly even than the LibDems. It’s suggested that it would be utterly immoral, and likely to spark a major constitutional crisis, if Gordon Brown were to “form a government” after the election on the basis of having more seats than any other party but having come second or third in terms of votes cast. The first thing that’s wrong about this scenario is that no-one will be asked to “form a government” after the election, whatever the result, until and unless Gordon Brown resigns as prime minister (which would automatically mean the rest of the present government also resigning). Until he goes to the Palace to resign, he is constitutionally entitled to continue in office as prime minister; all other ministers similarly remain in office (unless sacked or reshuffled by Brown); and neither Brown nor anyone else is “invited to form a government”. This is the case even if the Conservatives have won more seats than Labour, as well as more votes. There are only two circumstances in which Brown will be constitutionally obliged to resign: if Labour loses the vote in the House of Commons to approve the Queen’s Speech at the opening of parliament, some time after the election; or if the government is defeated in a vote of confidence, probably even later. Of course Brown may choose to resign the premiership earlier, taking the rest of the government with him (for example if he sees no realistic possibility of being able to get his programme and budgets approved by parliament and if David Cameron has an obvious entitlement to the first go at forming a government): but he is not constitutionally obliged to do so. So long as there’s even the faint possibility that the LibDems may decide not to vote against the Queen’s Speech and not to vote No in a vote of confidence in his government, Gordon Brown is entitled to soldier on. The second point most often overlooked is that Gordon Brown will be under no moral or political obligation to resign as prime minister, just because Labour may have won fewer votes than the Tories and/or the LibDems. The precedents are quite clear. Three elections since the second world war have produced this anomalous result. In 1951 Labour, elected in 1945 in a landslide and re-elected in 1950, won more votes than the Conservatives, indeed more votes than Labour had ever won before (even in 1945) and more than it has ever won since, yet won fewer seats than the Tories, so Attlee immediately resigned and Churchill, defeated in 1945, came back as Conservative prime minister. No-one seems to have complained that this was unacceptable or immoral. The same thing happened at both the elections of 1974, this time benefiting Labour, which won more seats than the Tories despite having won slightly fewer votes. After the first of these, Heath as incumbent prime minister tried to do a deal with the Liberals, remaining in office for four days while he haggled with Jeremy Thorpe, but when he failed, he resigned and Harold Wilson formed a minority Labour government. Eight months later Wilson asked for, and was granted, a dissolution and fresh elections, at which Labour narrowly secured an overall majority (319 seats out of 635!). Few if any complained at the time of the first 1974 election that Labour, as the biggest single party, occupied No. 10 Downing Street despite having won fewer votes than the Conservatives: and the narrow overall majority of Commons seats won by Labour eight months later was not regarded as invalid even though once again the Conservatives had actually won more votes. There’s a third easily overlooked factor pointing to the likelihood of Labour continuing in office for some time after the election if there’s a hung parliament, regardless of the number of seats and votes won by Labour compared with the scores of the other two major parties. The prospect of a hung parliament has for some time alarmed the City and the international markets because of the risk of a prolonged period of political uncertainty while the parties haggle over the deals or partnerships necessary for the formation of a stable and durable government able to tackle the huge problems of an unprecedented budget deficit and the mountain of national debt, as well as the task of nursing and accelerating recovery from the recession. There is a fear that such uncertainty, if it lasts more than a very few days, will cause a run on sterling, turmoil in the bond markets and a possible need to raise interest rates, which would slow down and perhaps reverse Britain’s economic recovery. To avert this potentially damaging fall-out from a hung parliament, the Cabinet Secretary, encouraged by the prime minister (and possibly with the agreement of the other party leaders), has written a new “rule book” — although No. 10 Downing Street has demurred at this description, asserting that it’s no more than a codification of existing and hitherto unwritten constitutional practice. The Cabinet Secretary’s code, apparently taking the form of a new chapter for the Civil Service Manual, provides, among other things, that if a hung parliament results from an election, the incumbent prime minister, regardless of the number of votes or seats his party has won, should not and must not resign as prime minister until it’s clear that there is a specific alternative MP likely to be able to form a government that will win the support of a majority of members of the House of Commons, expressed in majority support for that government’s programme, as defined in the Queen’s Speech. This formulation is designed to protect two fundamental constitutional principles: the nation’s government must be able to be carried on without a significant hiatus; and the monarch must not be placed in a position of being forced to make a decision (such as having to choose whom to invite to try to form a government when there is no consensus on whom she or he should choose) that would entail, or seem to entail, political partisanship as between the parties, thus potentially damaging confidence in the monarchy’s position above party politics. This (probably new) rule has important implications. Newspaper editorials claiming that Brown will be morally and politically obliged to resign immediately as prime minister if Labour comes second or third in terms of votes cast, have got it wrong. Brown and the Labour government would be obliged to continue in office for as long as there was any uncertainty about how the LibDems would vote on a Labour or Conservative government’s Queen’s Speech or on a vote of confidence in either government. What’s more, the dilemma facing Nick Clegg will not be which of Labour or the Conservatives to ‘support’ in a hung parliament, but whether deliberately to bring down the existing Labour government in the vote on the Queen’s Speech or in a vote of confidence in the government. But a decision by the LibDems to bring down a Labour Government could be taken only if they were prepared to commit themselves to acquiescing in a successor Conservative government under Cameron: it would be indefensible for them to refuse to allow both Labour and the Conservatives to hold office, since to bring down both, one after the other, would certainly cause a prolonged period of uncertainty while fresh elections were held — and in a second election caused by such LibDem negativity, the result would almost certainly be a LibDem wipe-out and the election of a Conservative government with an overall majority. Is that what the LibDems would want? In other words, the LibDems’ ability to exact policy concessions in return for their ‘support’ for either Labour or the Conservatives is very limited: if either of the other party leaders refuses to grant the concessions demanded, the LibDems’ only sanction is to bring down, or threaten to bring down, that party’s government — and if that precipitates a fresh election, the LibDems are likely to be the principal losers. It will be like an insect that can use its sting only once, because it dies as a result of using it. Nor will the LibDems have the luxury of choosing which of the other two parties to threaten to bring down if their policy demands are not met: if Gordon Brown chooses to carry on as prime minister until Labour is defeated on the floor of the House — as indeed the Cabinet Secretary’s new ‘rule book’ requires him to do in the absence of a firm LibDem undertaking to allow a Cameron government to take and hold office instead — the LibDems will have to make their choice in relation to a Labour and only a Labour government. Since by voting down a Labour government they would implicitly be demonstrating willingness to support, or acquiesce in, a Conservative government, Clegg would be risking a deep rift in his own party, most of whose members would prefer to allow a Labour government to continue in office rather than putting the Tories into No. 10 — this time without the option of turning them out, too, anyway for some time to come. Thus the logic of the situation may virtually force Clegg to accept any offer from Brown either to join a Labour-LibDem coalition, with a few seats in the coalition Cabinet for Clegg, Cable and one or two others, giving them considerable influence on government policy, but with an inescapable obligation to support some Labour-inspired policies that the LibDems would prefer to oppose; or alternatively to give a conditional promise not to vote against the (Labour) Queen’s Speech or against the Labour government in a vote of confidence provided that certain basic conditions were met by Brown. If that happened, there would be no opening for Cameron to be invited to try to form a government since the Brown government would continue in office without interruption. Of course this would mean the LibDems facing a storm of bitter invective for having kept an unpopular Brown administration in office despite Labour having ‘lost’ the election. But the alternative — ejecting a broadly like-minded centre-left government from office and installing a potentially far-right Tory government in its place — might be even more unpalatable for grass-roots LibDem members and supporters. The fifth and final point which seems to have escaped some commentators is that Clegg would be running a serious risk if he were to seek to offer to allow the Labour government to continue in office but only on condition that Brown stepped down, to be replaced by, say, David Miliband as the new prime minister (but not necessarily as leader of the Labour Party). The moment Brown resigns as prime minister, the rest of the Labour government resigns also, right down to the most junior Assistant Whip. Moreover, when Brown goes to the Palace to resign, he may or may not be invited by the Queen to advise her on whom she should appoint to succeed him (he is not entitled to volunteer such advice): but even if he is asked for and tenders that advice, the Queen is not constitutionally obliged to accept it. There would therefore be no guarantee that the Queen would automatically invite David Miliband to form a new (Labour-LibDem) government even if Gordon Brown has advised her to do so: she might invite Cameron instead. Unlikely, of course: but possible. I have not attempted to deal here with every possible eventuality if there is a hung parliament. One that is beginning to prompt a certain amount of speculation is what the Germans call a Grand Coalition, or what we sometimes call a government of national unity: a formal coalition of the two biggest parties, Labour and Conservative, with or without the participation of the LibDems also, usually only formed in the event of a national emergency. The question whether the budget deficit and the size of the national debt amount to an emergency comparable with the threat of a German invasion and the imposition of government by the Gestapo and the SS may be endlessly and fruitlessly debated. But Gordon Brown, who knows and understands the history of the Labour Party better than most, along with many other members or supporters of the Party, would be haunted and terrorised by the shade of Ramsay MacDonald if ever he had to decide whether to participate in a coalition government with the Conservatives. Another possible eventuality that I have not discussed is a LibDem decision to abstain from voting on a Labour Queen’s Speech, leaving it to the arithmetic of the House of Commons (minus the LibDems) to decide the outcome, with the nationalist and any single-issue MPs, if sufficiently numerous, holding the government’s fate in their hands. This alone would enable the LibDems to maintain their favourite position sitting on the fence, but it would lay them open to the charge of irresponsibility in throwing away their golden opportunity decisively to influence British politics and perhaps the UK constitution too. And I have not discussed yet another scenario, in which Gordon Brown, having come second or third in the number of votes cast, or having failed to win more seats in the House of Commons than any other party, defies the Cabinet Secretary’s ‘rule book’, or judges that it doesn’t apply, by resigning as prime minister immediately after the election, in which case Cameron would almost certainly be invited to form a government. This would present the LibDems with a different but very similar dilemma: whether to bring down a Conservative administration under Cameron by voting against a Conservative Queen’s Speech, with the inescapable implication that they would vote in favour of a Queen’s Speech offered by a restored Gordon Brown (or his successor as leader of the Labour Party). Perhaps only constitutional and political nerds actually enjoy splashing around in these murky waters. We may be pretty sure that the leaders of the three parties principally concerned, mentored by Professor Hazell and the Cabinet Secretary, are fully familiar with them, even if a surprising number of our media pundits are not. Anyway, it’s still far from certain that the election will result in a hung parliament: an overall majority for the Conservatives still looks to me a sound if highly unattractive bet. In which case all these speculative permutations will become academic fodder for Professor Hazell’s seminars, and nothing more — until we adopt Proportional Representation for elections to the House of Commons. Afterthought: I wish Nick Clegg and Paddy Ashdown would stop talking about the electorate not trusting either Labour or the Conservatives to govern on their own, if they vote for a hung parliament. This is palpable nonsense. The majority of those who vote Labour or Conservative (which means well over half of the electorate, even after the Clegg epiphany) want their party to win with an overall majority. A few opinion polls claim to have detected growing enthusiasm for the idea of a hung parliament, but that result depends heavily on the way the question is framed, and even then there’s a clear majority opposed. Even if you assume (without any evidence) that most — say two-thirds — of LibDem voters would welcome a hung parliament, and even in the unlikely event of the LibDems winning the same share of the votes cast on 6 May as the current polls would suggest, that would still amount to only around one voter in every five. No single voter can vote for a hung parliament: it’s not on the ballot paper, and the electorate comprises a few million single voters. Why can’t the parties work it out among themselves and then tell the Queen what they have decided? Brian writes: Thanks, Peter. That’s roughly what Gus O’Donnell’s new rule is intended to achieve, of course. But since in a hung parliament the decision on whether Brown or Cameron (or, almost inconceivably because of the way LibDem support is distributed, Clegg) gets the keys to No. 10 virtually depends on which way the LibDems jump, and given Clegg’s refusal to say in advance of the election which way that will be, the outcome may be determined by whether Brown chooses to resign as soon as the results are in or whether he decides to soldier on and meet the House of Commons with a Queen’s Speech, in effect challenging Clegg to bring down his government and put the Tories into power instead. It’s possible that it may all be sorted out between the three party leaders behind closed doors before parliament meets, and the result of the discussions conveyed to a grateful Queen, but it’s not easy to see how they could arrive at an arrangement that all three could sign up to, and it may have to be played out on the floor of the House. Fascinating. I’ve been forecasting a hung parliament for some time now (UK Polling Report seems to agree). In that eventuality, it sounds as if Labour will have a lot more room to manoeuvre than we’d thought – or, more to the point, the other major parties will have a lot less. Let’s hope Brown gets good advice and keeps his nerve. I certainly don’t think a Grand Coalition is a runner – sharing power with the Tories has been tried three times now, and the smile tends to end up on the face of the tiger. (The wartime coalition is an interesting exception.) I’m afraid it’s going to depend which way Clegg jumps. The idea of the Lib Dems deliberately sinking Labour so as to embrace Cameron seems fairly grotesque, but it can’t be ruled out – you can’t overestimate the Lib Dems! Brian writes: Thank you for this., Phil. I agree. A large part of the problem for Clegg is that the LibDems are divided as to which of Labour and the Tories they would prefer to see in No. 10, Clegg probably tending towards the Tories, while Huhne, Cable and a majority of the LibDem grass roots membership seem to lean towards Labour (but not necessarily towards Gordon Brown!). So they take refuge behind the fiction that it’s up to the electorate to decide, not up to them; or alternatively that they’ll let into No. 10 whichever of Brown or Cameron offers them the biggest policy bribe, which they hope will be headed by a firm promise of a referendum on so-called electoral ‘reform’. As you say, the LibDems are a collective loose cannon on the political deck, and the conversion of the election campaign into a television beauty contest on the lines of the X Factor or Britain’s Got Talent has made them a loose cannon of considerable size and weight. The transformation of Nick Clegg into a combination of Ross Perot and Sarah Palin (“I’m the honest Joe Outsider, promising to transform the filthy political system with my New Politics”) is pretty nauseating. It may however be some comfort if this development deprives Cameron of an overall majority. Very interesting …. thanks for this. However to liken Clegg to Perot (millionaire fantasist) or Palin (hard right & naive) seems a bit much. He (Clegg) has played a canny hand and seems somewhat more politically mature than either of those two blowhards to me! In fact I’m not convinced of the X-Factor comparison. Readers of this blog may well read every dot and comma of the manifestos at each election, but the majority of the population don’t. At least we are getting extended periods of substantive policy debate in prime time. With 1/4 (1st debate) and 1/10 (2nd debate) of the voters watching. Brian writes: Thank you for this. It’s good to be positive. Of course I accept that Clegg is more unlike than like Perot or Palin in very many obvious ways. But I suggest that he pitches his appeal at much the same target audience, posing as the Outsider who will ride into town (Westminster, Washington DC) out of nowhere, shoot up the corrupt old gangsters (“the old parties”!) who have been mismanaging the place for years, pin on his sheriff’s badge and start a new, Persil-clean régime that will be different (in almost wholly unspecified ways) from the bad old days. He’s the anti-politics politician who’s the only honest guy in the election battle. Yet when you examine his stall, it’s full of the same old familiar rubrics and qualifications. Bring home the boys from Afghanistan but not yet. Don’t abandon all idea of replacing Trident: just have a look at some cheaper alternatives, and for God’s sake don’t give up the “independent” nuclear deterrent. There’ll have to be “savage” cuts in government spending (Cable’s word, I think) but don’t worry: we’re the only people who’ll actually put money in everybody’s pockets. Nothing at all on IPPs, ASBOs or control orders (unless it’s buried in the LibDem manifesto — but if so be careful not to mention it on telly for fear of sounding soft on terror and crime). We’ll do it differently, make a change, but you’ll have to wait and see exactly how. Sorry, but I’m not impressed. As for the X Factor, try watching the hours of post-debate analysis on all the channels and listen to it on the radio. It’s almost all about the three stars’ body-language, whether they looked at the studio audience (bad) or into the camera (good), whether they remembered and used the first names of those who asked questions, whether they looked at the speaker when not speaking themselves, whether they sounded more or less nervous than in the first debate, whether they looked into each others’ faces when they shook hands with one another at the end, whether their terrible jokes sounded rehearsed, whether they seemed sincere. I can’t recognise a “substantive policy debate” in exchanges where each contribution is limited to one minute or 90 seconds, reduced accordingly to appalling sound-bites. If we’re going to have debates between the party leaders, why not invite them to solid discussions of policy such as Meet the Press and several other of the first-class American current affairs programmes in which there’s extended and courteous discussion of serious policy issues with very few interruptions and almost no slanging matches? I really think these debates, or anyway the two we’ve seen so far, have debased British politics, probably irretrievably. Trivialising such issues as are raised, they also crowd out almost all other coverage of the election campaign. Even the broadsheet print media carry on about them for page after page. Why is Clegg the bright star of the debates? Not because his policy proposals are so attractive and persuasive, but because he has novelty value (how many TV watchers knew who he was before the first debate? ), he’s fresh-faced and good looking, he’s confident and relaxed (that hand in his pocket! ), and he echoes the scorn and derision that millions of people have adopted in their attitudes to such familiar pols as Brown and Cameron. What strikes me most about him is how much he resembles Cameron and how different both are from Brown! Brian, is this a realistic possibility in view of the fact that it used, at any rate, to be the case that in Labour strongholds far more votes were cast for Labour than were cast for the Tories in Conservative strongholds? In such places as Merthyr Tydfill, for examples, the Labour majority used to exceed the total number of votes cast for all other parties combined, but this was not true for the Conservatives in, e.g., Esher. Of course I may be thinking of the voting patterns of fifty years ago, when Britain still had a sizeable industrial base and the LibDems were not in the picture. Brian writes: Thank you for this, Tim. For some years now the position has been reversed and Labour now enjoys a very substantial advantage over the Tories as regards the relationship between votes and seats won: the calculation is that the Tories need as much as a 10-point lead over Labour in votes in order merely to catch up in terms of seats, and an even bigger lead to win more seats than Labour. I don’t think there’s a demographic explanation for this: I think it’s mainly because of very large disparities in the sizes of the voting populations of different constituencies, which just happen to benefit Labour at the expense of the Tories, and which result from major movements of population since the constituency boundaries were last drawn. This of course can and certainly will pretty easily and quickly be remedied if the Tories end up in office in two or three weeks’ time. Of course the poll figures could well change radically — in either direction! — in the remaining 12 days before the election, and probably will. The likeliest change is probably some decline in the currently swollen LibDem figures, caused by the novelty value of Clegg in the TV debates, with corresponding increases mainly for the Tories, possibly leading to an overall Tory majority in the Commons, in which case the anxious debates about the various hung parliament scenarios can all safely be deleted from our hard disks! But any decline in LibDem support could equally well benefit not so much the Tories but rather the Scottish, Welsh and Northern Irish nationalist parties, UKIP, the Greens, Respect, the Flat Earthers and even the BNP, making the resulting parliamentary arithmetic even more inscrutable than currently seems likely. Brian, the discussion here reminds me that the last time Britain reformed its Parliament (the Great Reform Act, 1832) was after some thirty years of debate, in which time it became increasingly obvious to everyone except, possibly, the vested interests, that reform was necessary. I would contend that the continuation of a situation in which it is possible for a sole governing party to return to office and, as in your scenario, to squat there not only against the wishes of the majority of voters (that has practically always been the case in the UK), but also despite having received less votes than not one, but two other parties individually, is untenable in the long run, just as the rotten boroughs were untenable in the long run. Whatever rulebooks have been written (and by the way, why is nobody in the UK screaming about “unelected decision-makers”, as they are so fast to do – often inappropriately – with regard to the EU, where decisions are of course collegial and include the UK’s not insubstantial vote), I find the hypothesis that you put forward unnerving for a modern democracy: it smacks of hanging onto power at all costs, of exercising methods of control and of being in denial about the need for reform in a changing world, rather than of responsible methods of democratic government. I have the feeling that this “Cabinet Rule” is an attempt to keep a lid on a pot that has started boiling over: that is not a very sensible thing to do, as pressure clearly needs to be released in British society and will be. Whether that comes about safely or otherwise is the responsibility of those who try to keep that lid on improperly. I suggest that the old guard in the UK denies the Lib Dems their place in the sun at the risk not of a Lib Dem revolution – they are not the revolting kind – but of a very nasty scenario from your lunatic fringe parties, who are just waiting for the awful mistake to be made. I disagree fundamentally that a coalition scenario need necessarily be as negative as the “hung parliament” bogeyman that gets wheeled out to scare British voters at every reprise. I also disagree with the hypothesis that a coalition cannot in itself effect sweeping reform, supposedly because of being constructed on a compromise. On the contrary: no lasting reform can be built without consulting and involving the people, which means the majority of the people, rather than a skewed representation. This also entails the need to educate those people rather better than has been done by Murdoch & Co: while I agree with your preference for Meet the Press-style debates, I am also realistic enough to know that they would not attract the mass audiences that have watched the leaders’ debates so far. In this, at least, those debates have provided a modicum of information (albeit in sound bites) that goes drastically further than anything that Joe Bloggs or Colonel Blimp has gleaned from the front page of the Mirror or the Telegraph in the last twenty years or so. Nor is there any need for PR to mean ungovernable parliaments: Germany’s double-vote d’Hondt system, coupled with a a minimum percentage of the vote on a regional basis to qualify for Parliamentary representation and the constructive vote of no confidence to avoid musical chairs in government, achieves just the right balance between answerability to the electorate and stable governability. I’m sure it would not be beyond the intellectual capacities of British politicians, political pundits and even stray unelected Cabinet Secretaries to devise some modified form that would provide adequately (far more adequately than the current system) for all of this and also certain reasonable British idiosyncrasies, such as the wish to be able to return an Independent member. Brian writes: Thanks, Pete. You make a very powerful case and I agree with much of what you say. You may well be right to predict that this year’s turmoil will precipitate a radical overhaul of our system with incalculable consequences for our politics. However, it’s important to recognise that the undoubted perversity of a situation in which a party can come second or third in terms of votes and still emerge as the biggest single party in the Commons is not a function of First Past the Post, but of badly out-of-date constituency boundaries which take no account of recent movement of people from towns and cities into smaller towns and the countryside: and that a redistribution of boundaries will soon put this right. FPTP only very rarely has such a perverse result (only once on an appreciable scale since the second world war, in 1951) whereas PR invariably entails anomalies, such as the composition and programme of the government resulting from negotiations (“horse-trading” is not an unfair description) in secret between politicans, not from the wishes of the electorate as expressed in votes (voters can’t predict what kind of government will emerge from the post-election negotiations and so logically can’t have voted for it): because of the disproportionate power that it gives to a third party with relatively little public support to determine which of the bigger parties is to form a government; and also because most PR systems achieve the aim of ensuring that every MP elected can claim to have been elected by a majority of the votes cast only by giving equal weight to first, second and third etc. preference votes, in defiance of the reality that second and subsequent preferences are obviously of less value than first preferences. FPTP reflects the common-sense view that the party with the most seats should normally form the government: rough justice, perhaps, but still justice. The fact is that every electoral system ever devised (and most of them are being used somewhere in Australia!) has both defects and advantages; none is 100 per cent fair and totally satisfactory. Moreover different countries have different political and constitutional cultures: a voting system that suits one country perfectly well may cut across the traditions and instincts of another. I think the present chaotic situation in the run-up to next month’s election in the UK and the agonising over how to manage a hung parliament if that’s what it produces will make some people think again about the merits of PR. Others will blame the chaos and uncertainty on FPTP (wrongly, in my view, but they will) and be strengthened in their view that it’s no longer acceptable. One further point. If the scenario envisaged in my post materialises, and Labour wins the most seats but comes second or third in the popular vote, as the Tories did in 1951, there’s a certain logic in allowing Labour to have the first go at putting together a majority in the House of Commons in support of its programme and policies, simply because the election result, whether measured in votes or seats, will inevitably translate into an overall majority for the two centre-left parties (Labour and the LibDems). Given that centre-left majority, it’s reasonable for the centre-left to be allowed to be the first to try to put together a government, either in the form of a Lib-Lab coalition, or more likely with a minority Labour government which the LibDems undertake not to defeat in a vote of confidence provided that the government adheres to certain policy agreements or even just understandings discussed between them beforehand. This way of looking at it is exactly the same as the way supporters of PR defend the groupings, alliances or coalitions that emerge into government from PR elections as reflecting the views of the majority of the electorate. In both cases it has undeniable validity, and in both cases it has an element of fudge. Brian, thanks for that response. I’d like to make a couple of further comments. FPTP has a long-established record of blatant unfairness and practical gerrymandering: I remember the days when Edward Short won Newcastle Central with about 10,000 votes, the Tory candidate had about 6,000 and the Liberal about 5,000. In my constituency (it was then Basingstoke), the Liberals polled 22,000 votes and came in third to Con 35,000 and Labour about 25,000, so the votes that elected Short were less than half the votes that were discarded for the Liberal candidate and 40% of the votes discarded for the Labour candidate. Of course, things were famously even worse in Britain’s most populous constituency – I think it was Basildon. That may have been OK for Labour and the Conservatives, balancing things out between them, but it was patently undemocratic for the Liberals then, and will be on 6 May again now. FPTP is an open invitation to “forget” to adjust boundaries. I suggest that the scenario is fundamentally diffferent today from your past example of 1951, when the Liberals were at rock bottom. You are now facing a situation in which it is not inconceivable that there will be a three-way situation in the country that is radically different from that in Parliament, i.e. not a two-way situation. That makes a world of difference. If the Lib Dems attract more votes than Labour, but win far fewer seats, as in your scenario, I find it to say the least democratically questionable that Brown be allowed – by a Cabinet Secretary’s rule rather conveniently established under the governing party’s monopolistic leadership but never appproved even by one of Britain’s somewhat undemocratically elected Parliaments – to hog the power and oblige the Lib Dems to toe the line. It may be all in the better interest of the centre left, but to my mind it looks rather too much in the better interest of Gordon Brown first and foremost, Labour second and the Lib Dems only after a considerable margin… as usual, relegated to also-rans, despite winning more votes than Labour (in this scenario) and left to carry the can for unpopular Labour policy, the ideal lamb to the slaughter on the altar of a future Conservative election win. Neatly wrapped up and returned to sender…. where the Labour-Conservative duopoly would no doubt dearly like the Lib Dems to have to good grace to disappear, thus restoring the cosy old atmosphere of 1960 or thereabouts. What I like about the d’Hondt system is that it cn be appplied to maintain the single-member constituency elected on the basis of FPTP, while ironing out the discrepancies on a regional basis by adding a proportional list to make up the difference. The result is the best of both worlds: a direct contact to a local MP, which I think is an invaluable feature of the British political set-up, plus a fair parliamentary representation of the electorate’s will, essential for the major decisions that influence national policy . Personally, I think that a single vote without any frippery (STV AV and all that jazz) is best and most straightforward: it should not be necessary to hold a degree in maths to understand a voting system. That vote could be counted once for the local FPTP and again for the proportions, in which case the members already elected for given parties by FTPT are counted against that party’s proportion. Easy… and fair. Sorry, I disagree with the concept of horse-trading: that’s more of the bogeyman being wheeled out, I’m afraid. Of course it does happen, especially in those countries (like Italy), where party leaders have ensured that all the power is concentrated in their own hands and they hardly even deign to present a credible manifesto at election time, just a collection of slogan-like platitudes, so as to leave themselves ample space for just such horse-trading. Berlusconi’s famous tendency to execute 180° turns whenever it suits him is a fine example. But I’d like to think that Britain’s hundreds of years of practice with some form of oligarchic democracy has given it a bit more acumen than to allow that to take place. My contention is that you are tackling the question of coalition from the wrong side: you assume it is a problem, rather than accepting it as a challenge. Since you perceive it as a problem, you are indulging in a spot of damage limitation, trying to confine it and hope that people will “come to their senses”, as it were, and go back to the good old reliable days of to and fro. But I contend that it can and should be seen as a challenge, something positive: that requires a new mindset, one of open collaboration. What you call horse-trading, I call working together for the better of society… on condition that the rulebook is (the lack of subjunctive is intentional: I do not intend an optional situation) open and transparent for the public to see (so preferably not written by an unelected bureaucrat: I note you didn’t answer that one, but I suspect – hope – you agree with me). As our societies grow increasingly diverse, we need to learn to design new models of participation, both direct and through representative bodies. Our target must be social inclusion, cohesion and innovation. The world is changing so rapidly that no society can afford to keep on shoring up antiquated models (as before 1832), but should seize the opportunity to adopt a more flexible approach to political decision-making. Brian writes: Thank you again. Again I agree (or sympathise) with much of what you say. I certainly don’t assume that if we were to go over to PR, politicians or others would soon want to go back to the cosy old system of FPTP: we’d be stuck with PR for good. I don’t so much see PR as a problem in itself: rather I can see that it would create just as many problems as FPTP, perhaps even more, but different ones. In that sense it would certainly present a “challenge”! I understand your rejection of my description of the post-election haggling that PR and hung parliaments inevitably necessitate as “horse-trading”, although your rejection is somewhat weakened by your vivid description of the undeniable horse-trading that goes on in Italy — and plainly not only in Italy. I don’t recognise your summary of the scenario I envisage as one in which it’s “democratically questionable that Brown be allowed … to hog the power and oblige the Lib Dems to toe the line”: the opposite is self-evidently the case (Brown would actually be prevented from hogging the power, and the LibDems would be entirely free to decide whether they preferred life in some sort of partnership with Labour or with the Tories, neither of them being in a position to “force” the LibDems to do anything). I agree of course that there are major differences between the political situation now and that in 1951 when there were only two serious parties in contention (Labour and the Conservatives). But that doesn’t affect the point I was making: namely that on the only occasion since the war when the party (the Tories) which won more seats than its opponent (Labour) had won substantially fewer votes in the election, there was no argument about the right of the Tories to form the next government, and Attlee resigned as soon as the results were in. In other words, the right to form a government is related to the distribution of seats in the House of Commons, not to the number of votes cast for the different parties in the election, as some commentators on the right (but not in the right) now claim in the hope of preventing Labour from remaining in office if Labour wins more seats but fewer votes than the Tories. Finally, if it’s the case that the code produced by the Cabinet Secretary represents a change or new element in the constitution, then I would be tempted to share your indignation over the undemocratic way in which it has been imposed, especially as it appears to confer an advantage of sorts on the incumbent prime minister. But there’s quite a strong case for asserting, as the prime minister’s official spokesman has done, that it’s not new at all, but merely a codification of existing doctrine and practice. It would be interesting to know whether the other principal party leaders were consulted about the code and if so whether they agreed with it. Whether or not they were consulted, if they disagree with it, either in substance or because they don’t think it accurately describes existing principle and practice, it was always open to them to raise the matter in parliament (before parliament was prorogued for the election), challenge the code, and seek parliamentary action to reject it. But so far as I know, none of them did so. There’s no doubt that the central provision of the code — that after an election the incumbent prime minister is entitled to stay in office until defeated in a vote on the Queen’s Speech or in a parliamentary vote of confidence — accurately describes existing practice and precedents. The only element that might be held to be new is that the incumbent prime minister has a positive duty to remain in office and to continue to run the country’s affairs until a clear consensus has emerged on the identity of a successor demonstrably able to command majority support for, or acquiescence in, his or her programme in the House of Commons. The only alternative to this doctrine is to inflict on the monarch the obligation to make the most invidious and loaded decision possible on whom to invite to try to form a government if the incumbent insists on resigning before it has become clear who should succeed him, and the consequences of that are to threaten confidence in the impartiality of the monarch and to make it likely that there will be a period, possibly prolonged, in which the country will be adrift without a government. Of course this can be ameliorated by requiring the previous prime minister stay in office as a caretaker until the designated putative successor (or a series of them) can be shown to have succeeded or failed to put together a majority for a proposed new government and its programme: but that’s not much different from the Cabinet Secretary’s code. On that basis it’s not really all that controversial. Peter Hennessy, in the book that I mention in my post, is interesting on this. He strongly advocated, a decade ago, an initiative to agree a procedure that would relieve the monarch of the unwanted and inappropriate responsibility for choosing a new prime minister when there was no consensus on who it should be, arguing that this should be done at a time when no election was imminent and the matter could be discussed in the abstract and a solution found when no immediate party advantage or damage would be involved. Unfortunately no-one was willing to pick up this hot potato until now, when it is liable to be the cause of party political dispute because the situation with which it deals may well be imminent. If there’s one characteristic shared by all the leaders of the three biggest parties, it’s surely cowardice. It is not really true that “a situation in which a party can come second or third in terms of votes and still emerge as the biggest single party in the Commons is not a function of First Past the Post, but of badly out-of-date constituency boundaries”. It is partly that, but also partly because in the inner city constituencies which traditionally support Labour, the voter turn-out is lower. (The question regarding this is whether constituency boundaries should be established by reference to the average numbers of voters in fact voting in the area in question or by reference to eligible voters. I strongly support the latter, as do the Labour party, as you might guess). It is partly also because the Conservatives “waste” votes with overwhelmingly Tory constituencies in the south-east, whereas Labour support is more widely spread and so wins more marginals. This is a situation which would be masked but not solved by proportional representation. Conversely, FPTP amplifies differences and so generates what might seem to be implausible outcomes which, on critical examination, are not implausible at all except to those who want to use it as a weapon to argue the case for proportional representation. Brian writes: Thank you for this useful correction. However, (1) I’m not clear how it can be the case that low voter turn-out in traditionally Labour inner-city areas helps to account for the advantage that Labour indisputably enjoys over the Tories in the relationship between votes and seats — it would seem to reduce that advantage, not help to explain it; and (2) the fact that the Tories waste votes in “overwhelmingly Tory constituencies in the south-east, whereas Labour support is more widely spread and so wins more marginals” is surely just another way of saying what I said, namely that movements of population since the boundaries were last drawn have benefited Labour and disadvantaged the Tories. As we all know, the situation was the opposite for many years after the war: Labour wasted votes in the great industrial cities while the Tory votes were more evenly distributed around the country. Part of the reason for the reversal is the hollowing out of the old industrial inner cities with a lot of Labour voters moving out to new towns, suburbs and even country villages. It’s very unfair on the Tories, but it used to be very unfair on Labour — swings and roundabouts? And it will be fairly straightforward to put it right. Incidentally I can’t imagine anyone seriously arguing that redistribution should be based on average voter turnout rather than on numbers of eligible voters, whether they choose to vote or not. (1) Lower turnout means that although you win the seat you need less votes to do it. You therefore contribute less to the overall UK-wide vote for the party, which seems to be what is concerning you (or concerns those who say that winning most seats with the lowest UK-wide vote is an outrage). Where the Conservative win a seat they generally need more votes to do it because of higher turn-out in their constituencies, hence adding more to their UK-wide vote. It’s just a matter of the mathematics of the situation. (2) No, this is a different point. You could get the most UK-wide votes, but if they are all concentrated in a few seats where you get overwhelming majorities with high turn-out (ie the greater south-east of England) then that isn’t going to help you in terms of seat numbers. Were Labour voters to move out of the towns but retain their Labour allegiance (your example), that would reduce the over-concentration to which I have referred, not increase it, once boundary revisions have caught up. Since we are on the subject, the boundary revisions are not quite as out-of-date as you suggest. This election is actually being run on new boundaries as compared with the last two elections. They are inevitably a small number of years out of date (about 5) but that is inevitable unless the Boundary Commission operate on a predictive basis, which is what the Conservatives want. Regarding the process, I have a scenario and would like your comments, as it is looking increasingly likely. Conservatives largest single party, well short of a majority. Clegg has said he will not support a Brown led Labour government. Therefore, Brown will have to resign at some stage. Let us assume that Labour and Liberals agree that they will have a coalition under a different Labour leader. Brown hangs on until this is done, then resigns, and say Miliband is the new Labour leader. Firstly, how on earth would HM decide who to ask next? If Labour have clearly lost the election Cameron could and would make the case that he should be asked next as the leader of the largest party in terms of seats. He is probably correct – the Labour leader has resigned because he cannot avoid a defeat in the HoC. On what basis could HM ask Miliband before Cameron? Based on your other post, Cameron IS entitled to form a government before anyone else from Labour has a go if he has the most seats. The most likely option, surely, is that Cameron gets a chance but he is told that there is a LibLab pact and he will lose the QS vote. He carries on anyway. Personally, I think that for the LDs to vote him down at this point would be suicide, but let us say they do. Cameron goes to HM to resign. Why can’t he simply ask for a dissolution instead? He could say that (1) the leaders of both the largest parties have had a chance to form a government and failed and that (2) it would be unfair for Miliband to be asked as he did not stand for PM in the election and (3) Clegg cannot command the support of the majority – all good points. How would HM decide whether to grant him a dissolution – there seems to be no rule that you have to keep inviting people to form a government. If Cameron was smart, he would ask for a dissolution before the QS if he sees that the LDs will vote him down, which will make it far more difficult for HM to refuse (she is meant to accept his advice after all). So, in these two cases, what happens? Brian writes: Thank you for this. I have tried to answer the questions you raise in my response to Pete Kercher’s further comment immediately below. But the short answer to your main query is that there is nothing automatic about the leader of the biggest party in the Commons having the right to first go at trying to form a government, unless his party has an overall majority in the House. Here we are discussing the situation if there’s a hung parliament in which no party has an overall majority. In that case the question is which person has the best chance of forming a government with majority Commons support, and that person is not necessarily the leader of the biggest party. Now read on…. A very interesting discussion Brian, thanks. I’d like to look at Ryan’s scenario. It has always been my understanding that constitutional convention allows the incumbent PM to ask the sovereign to dissolve Parliament, but I cannot recall a situation in which an MP, having been called on by the sovereign to form a government and failed, has then successfully applied to the monarch for dissolution. Nor am I at all certain that this could be permissible: I believe it would be a major innovation – and a very risky one at that, still premised upon two-party thinking that simply does not reflect the real-world situation in the UK today. In this respect, I think that Parliamentary practice may just be entering uncharted waters, though I feel that there would be a moral obligation on the monarch (or rather, her advisors) to face facts and accept that things are changing. While I agree that, prima facie, the monarch may be departing from recent Parliamentary convention in calling, say, Milliband to the Palace, I must point out that it is far from unprecedented for the monarch to appoint a PM who was not the explicit party leader at the time of the previous election (as Ryan raises this point). I could go back to the frequent appointments of minority or Palace-friendly leaders under George III, but I don’t need to: Brown himself did not stand for election as a PM candidate at the last general election, but was called to the Palace on the recommendaton of his predecessor. So the latest Parliamentary convention in fact tells us that the PM is the leader of the group that can command the majority in the Commons, even if that person has taken over from someone else and merely been confirmed by what may well be a majority that changes in the process (there are also precedents for floor-crossing, none more eminent than Churchill, who did it twice). If, then, Milliband could command a clear Parliamentary Lab+Lib Dem majority against Cameron’s “single largest party”, I see no reason why he should not be called to the Palace before Cameron, not after. And I’ll say more: if the deal (as Brian would call it, the horse-trading, though I don’t accept that it all necessarily has to stoop to the same low levels as it has in some countries) provides that the PM canddate be Clegg himself, then the fact that he may have only 100 MPs is irrelevant if he can command that Lab-Lib Dem block in the House. I know that this particular scenario is unlikely, but it is not without precedent, Ramsay Macdonald licet. Obviously, here I am not necessarily writing about what is politically advisable or even desirable – that is another matter entirely, dependent upon one’s personal preferences – but about what is provided for (or not, as the case may be) in Britain’s constitutional conventions. Brian writes: Many thanks to you and to Ryan for taking the discussion further into these fascinating but plausible scenarios. As the hypotheses multiply, of course it becomes increasingly difficult to predict what would happen. But a couple of points are worth making. First, as you rightly mention, the person invited to try to form a government doesn’t have to be the leader of his party. When Churchill became prime minister at the head of the wartime coalition government, he was not leader of the Conservative party. So if the LibDems were to make it a condition of going into a coalition/partnership/understanding with Labour that Brown should not be the prime minister — and that they would be prepared to enter into such a relationship if, say, D Miliband were to be the prime minister — it would not, repeat not, be necessary for the Labour Party to go through the tortuous procedures laid down in its constitution to replace Brown as its leader and to elect Miliband in his place. There would be nothing to stop Brown continuing as leader of the Labour Party while Miliband accepted an invitation to try to form a government. Of course this would require the approval, or at least the acquiescence, of the rest of the Labour Party. But if the prize were to be a fourth term for a predominantly Labour government…. Secondly, in the scenario you posit, the Queen (and her advisers), following a Labour-LibDem agreement on a Labour-LibDem government under D Miliband and Brown’s consequent resignation as prime minister (but not necessarily as leader of the Labour Party), would be guided by the principle that she should invite to the Palace the person who in her judgement had the best prospect of securing the support for his government of a majority of members of the House of Commons. This need not be the leader of the party with the most seats, at any rate if no party had an overall majority in the Commons. If, in the situation we are envisaging, Brown and Clegg were to inform the Queen’s private secretary that both Labour and LibDem MPs were willing to support a Labour or Labour-LibDem government under D Miliband and that Brown would resign to make this possible, the Queen might well judge that Miliband would have a better prospect of forming a government capable of winning the support of a majority in the Commons than Cameron, and she would presumably act accordingly. Thirdly, what if Cameron, having tried but failed to win a vote to approve the Conservative government’s Queen’s Speech, were to resign and ask the Queen for a dissolution and an immediate second election? (This scenario assumes that the LibDems have voted against a Labour Queen’s Speech, forcing Brown to resign, and that Cameron has thereupon formed a government, submitted a Queen’s Speech to parliament, and has also been defeated by LibDem votes — very unlikely; or else that Brown has resigned immediately after the election without attempting to do a deal with Clegg, and that Cameron has been invited to form a government as leader of the largest party although also without having come to any agreement with the LibDems.) In these circumstances the Queen would be free either to grant Cameron’s request for a dissolution and a second election, or to refuse it. The grounds for a refusal could be either (i) that in her judgement there was someone else with a fair chance of forming a government with majority support in the Commons and that that person should be given an opportunity to try to do so before the country had to be faced with another election, (ii) that on the evidence a fresh election so soon after the last one was unlikely to produce a materially different result, (iii) that the country should not have to suffer the expense and inconvenience of yet another election so long as there remained a possibility of a durable government being formed by someone else, or (iv) that in the current economic, financial and political situation it would be contrary to the national interest to delay the formation of a durable government, able to take tough decisions with parliamentary support, for the length of time that it would take to dissolve parliament and hold another election — or any combination of these four grounds. However, the Queen would be taking a big risk by refusing a dissolution to an outgoing prime minister. If despite all her efforts she failed to find anyone who could succeed in forming a government with majority support in the Commons, a dissolution would become inevitable. But in the crisis that this would precipitate, it seems almost inconceivable that the LibDems would resist the huge pressure on them to throw in their lot with either Labour or the Tories to enable a government to be formed and the crisis resolved. It might of course require a compromise over who should be prime minister in the new government: quite likely not Brown! Only one thing matters in the House of Commons – SEATS. [Seats amount to political power: votes amount to democratic legitimacy. Since World War 2, no government has ever won more than 50% of the votes cast]. The biggest party in the Commons forms the next government. All this other discussion is interesting but, in reality, it is about trying to retain Gordon Brown in power. 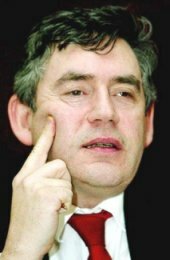 Please remember that Gordon Brown was not party leader when Labour won the 2005 election and Gordon Brown has not, until now, fought an election as party leader. [He is widely thought to have “bottled it” in 2007]. If, having done so, he fails to become the largest party (seatwise) in the Commons then he is history in political terms. Ultimately, it is political reality which matters. Brian writes: Thank you for this. As you say, constitutionally it’s only seats that matter, although of course public and media opinion, perhaps egged on by a frustrated Opposition, may rely on “democratic legitimacy”, as defined by votes cast rather than by seats won, in the hope of producing the outcome they desire, and apply very strong pressure to get it. The bulk of the discussion here is not, I think, about “trying to retain Gordon Brown in power” but about constitutionally and democratically proper procedures by which Labour could remain in power, on its own or in some kind of partnership with the LibDems, and with or without Gordon Brown remaining prime minister. I can understand some people regarding this as Macchiavellian manoeuvring designed to pervert the democratic process, but I would defend it on two grounds. First, virtually any conceivable result of the election on 6 May will produce an overall majority of both votes and seats for the centre-left: i.e., the centre-left will almost certainly win more seats and votes than the centre-right Conservatives and the other minor parties of the right. Of the two main centre-left parties, Labour is virtually certain to win more seats than the LibDems; Labour is already in office and will remain in office until Gordon Brown resigns; so Labour is bound to be the senior partner in any centre-left alliance (whether a coalition, a partnership, a co-operation agreement, or a series of understandings). There is therefore nothing undemocratic in Labour presenting a policy programme in a Queen’s Speech to parliament and inviting all centre-left MPs to support it. If they do, there will be a democratic majority enabling Labour to remain in office, with or without LibDem or other partners. Nothing undemocratic about that. Secondly, and more contentiously, I (and I suspect several contributors of comments to this thread) believe that a Conservative government under Cameron would be a tragic disaster for this country and that it is right and necessary to employ every possible means within the bounds of constitutional and democratic propriety to prevent it. Of course others will strongly disagree, and it’s clearly open to them to think of ways to increase the likelihood of a Cameron government taking office. To Obiter J: if you read my comments, I think you will find nothing about keeping Gordon Brown in power. On the contrary, I am arguing that, under the most probable circumstances, it would be highly inadvisable for him to try to cling to it. Brian and I have discussed the hypothesis posited by Ryan, that of David Milliband (for example) being called to the Palace to attempt to form a coalition. That does not read, to my mind, as an attempt to keep GB in power: although I dare say he would be a backbench member of the government majority, I do not rate that as staying in power. In point of fact, we have discussed quite extensively the very fact that you raise: that GB was not indeed party leader when Labour was returned in 2005, so I fail to grasp why this discussion should be, as you say “in reality, […] about trying to retain Gordon Brown in power”. I’m sorry, I disagree with your reading of the discussion. By the way, as a convinced Lib Dem supporter, I’d far rather see the Lib Dems returned with an overall majority, so obviously have no interest whatsoever in retaining GB in power. But what we are discussing here pertains to the possibilities open to the constitution in the likely event that no single party obtains a majority: a little less exciting perhaps, certainly very technical stuff, but of vital importance right now. Brian writes: Thank you for this. It all helpfully reinforces my own response to Obiter J’s comment immediately above. There’s one intriguing possibility you’ve been perhaps too deferential to consider. What if the burghers of Kirkcaldy and Cowdenbeath decide to go SNP, or even LibDem? As we’re constantly being told, it’s a whole new world we’re living in. As for the Pope and the spoof paper written by a group of junior people in the Foreign & Commonwealth Office, I can’t believe the humourless pomposity that has led the government to issue this craven apology to the Pope. Considering the way the Pope dresses himself up, it’s surely a fair bet that he must have a sense of humour — which is apparently more than can be said for the members of his flock in Britain. I hope the ringleader of the jokers has been promoted as you suggest: he certainly deserves it. There’s a long and fine tradition of spoofs and parodies in the Diplomatic Service, which helps our diplomats to stay sane in the madhouse of international life. Long may it continue, with loads of egg on the faces of pompous idiots with no sense of humour. No further comments here on the Pope, please: back to the subject of the post. I have found this post and the comments very interesting. Readers might wish to see what “Democratic Audit” have to say – particularly in relation to the February 2010 Cabinet Office draft document relating to “hung parliaments”. I offer the link here without further comment. Brian writes: Thank you for this link to the useful and fact-filled document. Although there are one or two things in it that I might quibble with, in general it seems an excellent summary. Incidentally the Cabinet Office draft chapter on elections and the formation of governments for the Cabinet Manual from which the Democratic Audit paper quotes extensively can be found here(PDF). I haven’t been able to find it in final form: it still seems to be a draft, although it appears to have the provisional approval of the House of Commons Justice Committee. Some of its provisions look startlingly new, although it purports merely to describe in writing hitherto unwritten conventions and principles of our mainly unwritten constitution. But more of them are members of the House of Lords than is healthy in a democracy. But Patrick Gordon Walker didn’t last long. Can I make 2 observations around your brilliant analyses–these being that at this election there are so many unknowables that all the polls could be very wrong and that there are huge dangers to Clegg of being left out of the loop on PR if he wants to keep his party independent. Firstly, I would suggest there will be more tactical voting than ever by Labour voters (despite party rules) but the weighting of this can’t be judged, nor can the reciprocity of Lib Dems many of whom seem to be on an emotional high just now, enthused the more by Guardian and Observer backing. Secondly,we can’t accurately judge the popularity of the Green and UKIP parties and how these may erode the votes of the larger parties, and we know there is a large anti-Lisbon faction and that green matters are very popular with younger voters and that the Green Party leader is the only woman in the race and that she is exceptionally able, clear and an outstanding communicator. Thirdly, do we know the effects of scandals on Irish politics? Fourthly, this is an election which has a huge number of independent candidates, for example three in Eastbourne alone, whilst in many other constituencies there are specific anti-candidates groups against a sitting MP where it is believed s/he has behaved poorly over expenses. My second observations around a Hung Parliament are to ask the questions whether Tory grandees have privately told Cameron that they will consent to a referendum on PR but only if he needs it, and if Clegg could override opposition against such an offer in his own party which will back away from demands he makes from his new-found position of strength, especially if Labour comes 3rd in votes? In your analysis you develop the brilliant simile of the Lib Dems as at “a one sting and you die” moment so can they really remain independent if Cameron either makes an open and public offer of their agreement on a referendum within 6 months and that it has led to a Con–Lib Dem coalition, or has been able to negotiate a separate deal with the Ulster Unionists and /or various independents and doesn’t need the Lib Dems at all? Without this offer cast in steel by the Tory leader (if the grandees release him) and made publicly within say a few days of the election to seal a coalition, won’t Clegg be forced into a Lab deal where Brown has much support to do this, or run the risk of lighting the fuse-paper of another election which will destroy him in his party and at the polls — because the PR moment will have evaporated and he will be cast as the villain of the piece as being too demanding and difficult? Brian writes: Thank you for these exceptionally pertinent and interesting comments, Bill. You’re right to point out that there is an almost infinite number of possible permutations and imponderables about what will happen after next Thursday, making forecasting much more than usually perilous. I think you’re also right to point out that Clegg’s position if there’s a hung parliament will be much less powerful than the commentariat seems to believe. Will Hutton’s (apparently serious) proposal in today’s weirder-than-ever Observer (2 May 2010) that if there’s a hung parliament, Brown should step down as prime minister and Labour should offer the prime ministership to Nick Clegg at the head of a Lab-LibDem coalition, suggests to me that even such a normally level-headed observer as Hutton must have lost his grip on reality. Meanwhile support for the LibDems seems to be gradually declining and that for the Tories gradually increasing. If those trends continue, Cameron would seem to be heading for an overall majority, in which case we can say goodbye to the hung parliament scenarios, to PR, to the British economy and its recovery from recession, to social cohesion and national unity in accepting the austerity that will be required to satisfy the markets that we are going to pay our debts, to the welfare state, and to any lingering hopes of a more just and equal society. And an awful lot of people are also going to be saying goodbye to their jobs and probably to their homes. On which cheerful note…. Brian, if I didn’t already know which party you favour I think I could guess. You are letting your partisanship interfere with your analysis. Comment is free, but what about a bit of sine ira et studio? Just one more Pope comment (from a member of his flock). My favourite wall inscription in loyalist Belfast: someone had written “No Pope Here”; someone else wrote underneath “Lucky Old Pope”. Brian writes: Thanks, Oliver. I would be horrified if anyone reading this blog were to think me impartial. And I’m incapable of writing ‘sine ira’, when I look around me and read the newspapers or watch television. But I love the Pope counter-inscription! 2) the growing power of the “secondary” online underworld such as as these posts which so fueled Obamas campaign …e.g on Twitter where Sarah Brown has over 1.1 million followers the 3rd debate was called decisively for GB but not elsewhere except Channel 4. Facebook also has huge anti-Cameron groups. 3) In that the leaders debates became a beauty contest for so many who endure the X Factor, do impressions built on mere presentation become imprinted or are they hugely changeable? I suspect the latter. Brian writes: Thank you for this, Bill. I entirely agree that this election is unusually difficult to forecast. The Bank of England Governor is probably right: government for the next few years will be a bed of nails. Incidentally, if you’re really waiting for me to write a book, you may have a very long wait ahead of you! Previous story What if Gordon doesn’t resign on 7 May?